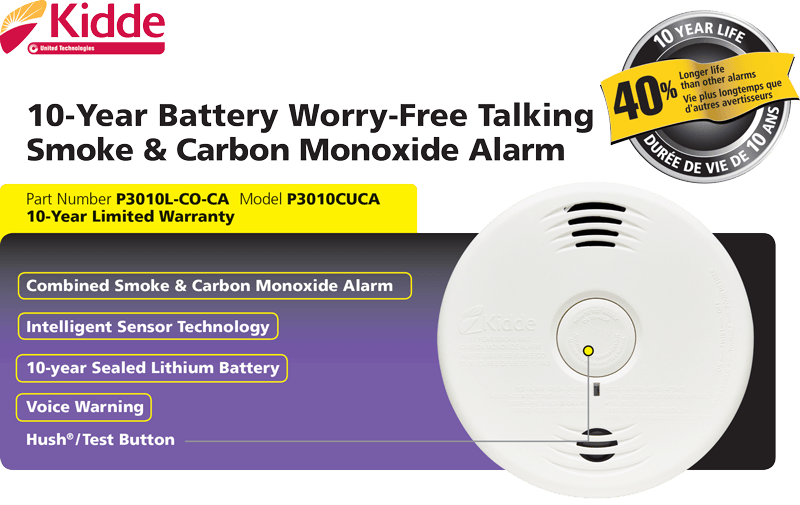 The Kidde P3010CUCA is a 10-year, sealed battery, smoke and carbon monoxide alarm that features photoelectric and electrochemical sensing technology with a Hush® feature. The 85dB alarm tone is accompanied by a voice warning feature. The alarm will automatically activate when it is attached to the mounting bracket; there are no pull-tabs, no switches, everything is automatic. At the end of alarm life, the unit will chirp, indicating the alarm is in need of replacement. The customer can use a simple tool such as a screwdriver to deactivate the unit, stopping the chirp and making it safe for disposal. This smoke alarm uses photoelectric sensing technology. Photoelectric sensing alarms may detect visible fire particles (associated with slow smouldering fires) sooner than ionization alarms. Ionization sensing alarms may detect invisible fire particles (associated with fast flaming fires) sooner than photoelectric alarms. Leading authorities recommend that both ionization and photoelectric smoke alarms be installed to help ensure maximum detection of the various types of fires that can occur within the home. • Combined Smoke & Carbon Monoxide Alarm – A single unit can be installed where previously, two were needed. Reduces installation time and protects against both fire and carbon monoxide dangers. • Intelligent Sensor Technology– Combines the detection capabilities of a photoelectric smoke sensor with that of an electrochemical sensor, which is used to detect CO. When either sensor notices a potential hazard, the alarm will adjust its smoke sensitivity to differentiate between a real hazard and a false one. • 10-Year Sealed Lithium Battery – Eliminates the need to replace the battery. No battery to replace for the life of the alarm (10 years). Battery automatically activates when the alarm is attached to mounting bracket. • Voice Warning – Announces the hazard type detected (in English and French). Alarm announces “FIRE!” when a smoke or fire hazard is detected and announces “WARNING! CARBON MONOXIDE!” when a CO hazard is detected. • Multi-function One Button Design includes: • Hush® Feature – Temporarily silences nuisance alarms for approximately 9 minutes (smoke must be present before Hush® is activated). • End of Life Notification – Ten (10) years after unit is first powered, this alarm will chirp twice every 30 seconds to indicate it is time to replace the alarm. • End of Life Hush Feature – Allows you to temporarily silence End of Life chirp 3 days at a time for a maximum of 30 day life extension.